Chauncey Foster Ryder was born in Danbury, Connecticut in 1868. He spent much of his youth in New Haven, Connecticut, where he began to pursue an interest in painting between the ages of ten and twelve. In his early twenties he moved to Chicago for artistic instruction, studying first at the Art Institute and then at Smith’s Academy, where he became an instructor after his first year as a student. In 1891 he married Mary Dole Keith, and in 1901 they sold their belongings and moved to France so that he could study art in Paris. He first enrolled in the Academie Julien, under Jean Paul Laurens and Raphael Colin; after two years there, he began to exhibit works at the annual Paris Salon, and showed works regularly there from 1903-1909. At this time he also developed a friendship with American artist Max Bohm, who profoundly influenced his style with his dramatic and moody compositions. In 1907 Ryder won an honorable mention for Ce Que Rende La Mer (That Which the Sea Gives Up), the figurative style of which is very different from Ryder’s characteristic landscapes, which even contemporaries recognized to be his usual style. 1907 was also an important year for Ryder when the prominent New York art dealer, William Macbeth, began to represent him, selling the first of Ryder’s works after only two months of partnership. This was a lifelong business relationship, and Macbeth was responsible for the marketing of Ryder’s painting style, as well as his works, hanging, framing, and even titling the production that poured from Ryder’s studio. That fall Ryder moved to New York City and began to show his work both in Paris and in New York, and finally in 1909 he opened a studio in New York. 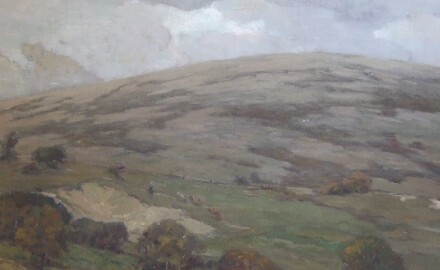 In 1910 Ryder began to travel through New England, the landscape of which provided much of the subject matter for his work. He and his wife bought “a little house and three acres in Wilton, New Hampshire,” and for the rest of their lives, they split their time between New York City in the winter months and New Hampshire in the spring and summer. From their home in Wilton they traveled throughout New England, and continued to do so until old age. From this point until the end of his life, Ryder’s works gained great popularity due to his consistently recognizable style, what is called his “Ryder green…that was, in part, responsible for the pleasing quality and unique character of his work,”. Shortly after the purchase of the New Hampshire property, Ryder began to undertake lithographs, in addition to the drypoints, etchings, drawings, and watercolors he already produced, at the behest of Bolton Brown, one of the premier lithographers of his time. These lithographs were shown alongside his paintings at Macbeth’s gallery in New York. Ryder died in 1949 in Wilton, New Hampshire. His work is known today primarily through his oil painting, and it was known and recognized at the time of his death for its “economy of line” (About the Artist). In addition, however, “the unusual and vigorous quality to his prints” (Chicago Society of Etchers) was also noted, and the way his landscapes engaged the aesthetic of the abstract without presenting abstract subject matter, in a time when the general public was unsure about how to approach truly abstract art.